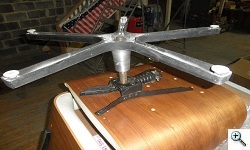 It is common for antiques from Europe or Asia to have had powder post beetles. Although they are supposed to be dispatched by methylene bromide fumigation upon arrival in our ports, sometimes they survive. It is unusual for powder post beetles to live many years after arrival in the US. We heat our houses so much, and air condition, that it is too dry for them. The way you can tell you have an active infestation is that whitish powder will come out of the holes, every week. You will see little piles of sawdust beneath the light colored, active holes. Dark holes mean there is nothing active in the those holes. A hole can conceal a 7′ long tunnel. The beetles live in a single hole their entire 7 year life, then make one hole when they are mature and ready to mate and lay their own eggs in other pieces. 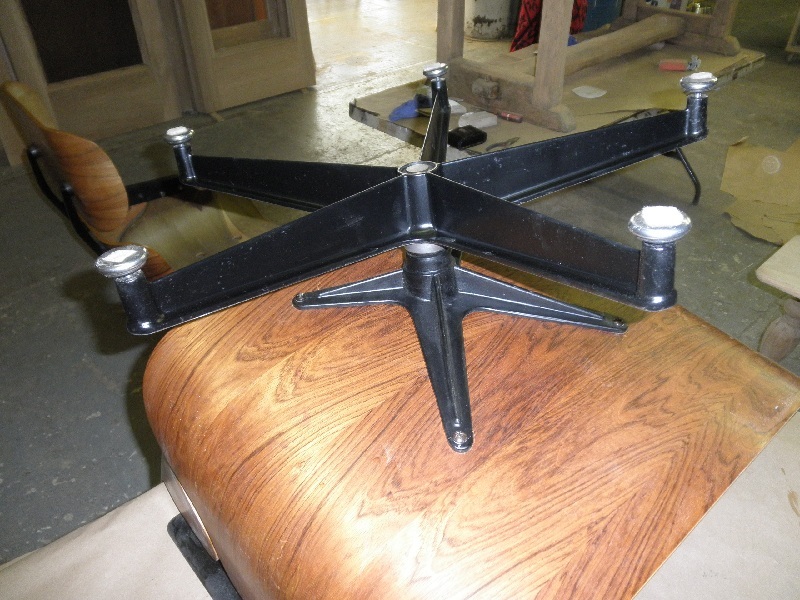 If you need to get furniture fumigated, there is typically a minimum charge of about $800-1100, which would cover quite a few pieces, or just one. 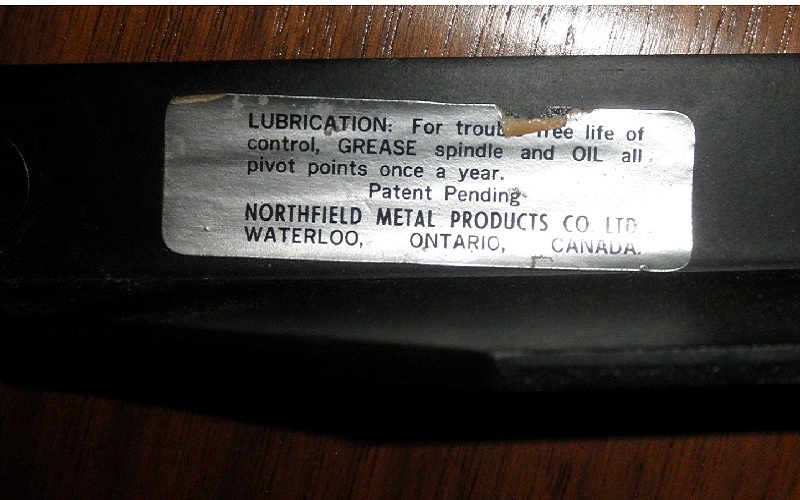 Another alternative to methylene bromide is carbon dioxide. Carbon dioxide takes 1 month to kill powder post beetle eggs, compared to methylene bromide’s few days. Carbon dioxide is harmless in low concentrations, fatal to humans at 6 – 15%, and to powder post beetle dormant eggs at 60%. Formerly just used for the occasional antique house, Carbon dioxide has become more popular with the resurgence of bedbugs, and is an effective, non-toxic and green alternative to methylene bromide. 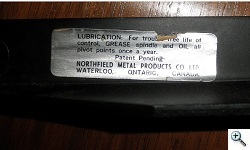 Licensed fumigators don’t release methylene bromide, but there is a potential for its escape. Email or call us with your powder post beetle infestation needs, and we will be happy to help rid you of the destructive pests. Seeking top notch old school machinist- a metalsmith, familiar with industrial machinery, and electrical, pneumatic, and hydraulic systems. Fabricate to shop and architectural drawings. 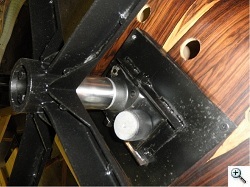 Design, set up, and tool for production, and custom fabricate. Shop maintenance, and restoration of historic ornamental and architectural metal work. Skills should include operation of lathe, milling, slitting and surface grinding machines, pressing with hydraulic, OBI and finger brake presses. . Tool and die design, jig set ups for production, and machinery operation. Welding TIG, MIG, brazing and soldering. Casting in sand or lost wax. Blacksmith and pneumatic hammer forging. Knowledge of metallurgy, tempering and annealing good. 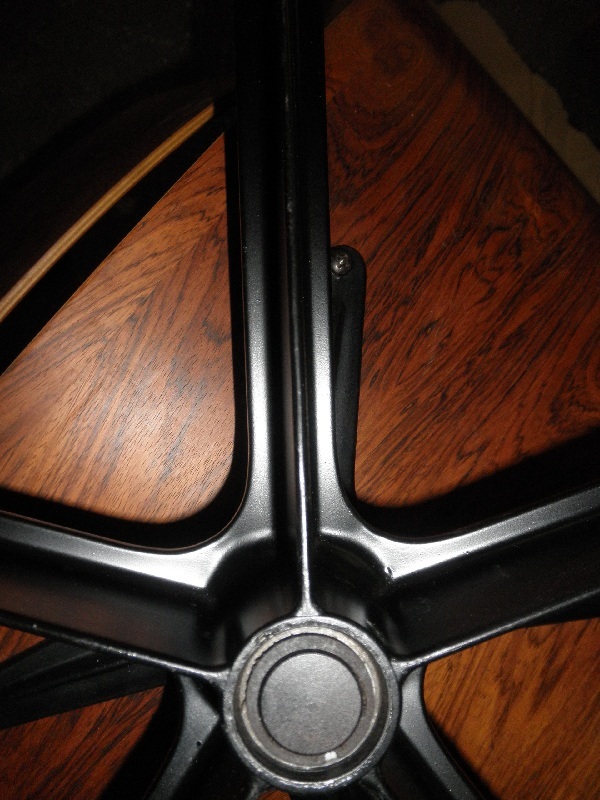 We also do patination, electroplating, abrasive media blasting, and finishing. Yelp has been widely accused of manipulating filter results to libel profiled businesses. Yelp filter libels businesses. Yelp hides behind the Filter results, using the “secretive” Yelp Filter to libel businesses. Why does the Yelp Filter selectively display negative results? If you believe Yelp, it is to remove false reviews. This is a lie. There is no clarity or candor to be found here. In the guise of protecting the public from false reviews, Yelp thinks it has legal immunity under the Community Decency Act § 230(c)(1) to libel any profiled company. Yelp characterizes their filter as mere Editorial discretion. The reality is, that Yelp needs to ruin the reputation of profiled businesses to make money. When it ruins the reputation of reviewed businesses Yelp sells advertising to other businesses advertising in Yelp on the Profile page of the damaged business. Yelp sells advertising by libeling profiled businesses, so readers click on links to other profiled advertisers. This is what makes Yelp profitable. That is what the evil Yelp is all about. Until now, the debate has been focused on whether Yelp is “extorting” businesses to advertise, by taking good Yelp reviews using the “Filter” into off-page filtered results, leaving predominantly poor reviews. But the real issue is whether Yelp uses the Yelp filter to libel businesses deliberately to sell advertising to other companies. If a review is good and the Yelp visitor reading the review clicks through to the reviewed company, Yelp makes nothing. Yelp is motivated financially to libel reviewed companies, to have readers select an advertiser on the profile page instead. Is motivation to libel built into the Yelp business profitability model? There is another law that may find Yelp without immunity to ruin the reputations of profiled businesses. The securities litigation industry is ordinarily vigilant against Rule 10b-5 violations, or a “fraud upon the market”. Inflating profits by libel may be found to fall under this cause of action. The 10b-5 statute only requires proof by preponderance of the evidence. This is a much easier standard for litigators to win than criminal statutes requirnig proof beyond a reasonable doubt. That is why class action lawyers prosecute such claims widely. How long will it take for a class action to be filed and to determine the legality of the Yelp “filter”? Such litigation may determine the dread Yelp Filter to be nothing more than a widespread fraud upon the public of businesses Yelp profiles, and the investors buying shares in Yelp. Does the Yelp filter libel business? Is Yelp defrauding investors by libeling businesses? What is your opinion? 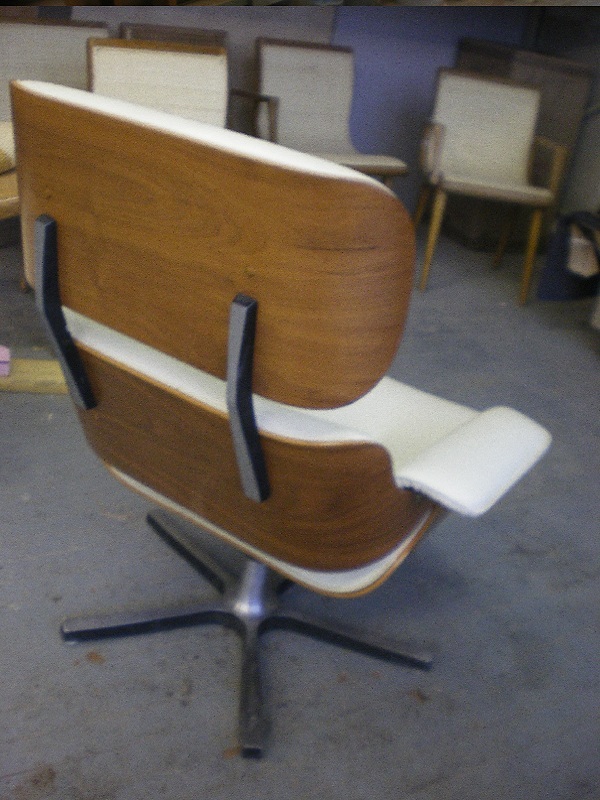 Have you ever looked at and wondered if a vintage Eames chair is real? After the Eames Lounge chair appeared in stores in the late 1950’s, competitors began to copy the chair’s design features, with similar chairs produced primarily by Plycraft and Selig. 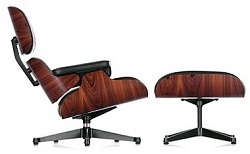 Knock-offs are easily distinguished from the Eames Lounge Chair by Herman Miller, but not so easily from the multitudes of knock-offs produced in China today. 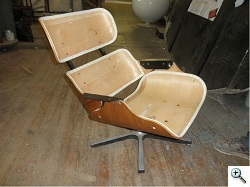 The Selig reproduction of the Eames Lounge Chair, from the 1960’s. 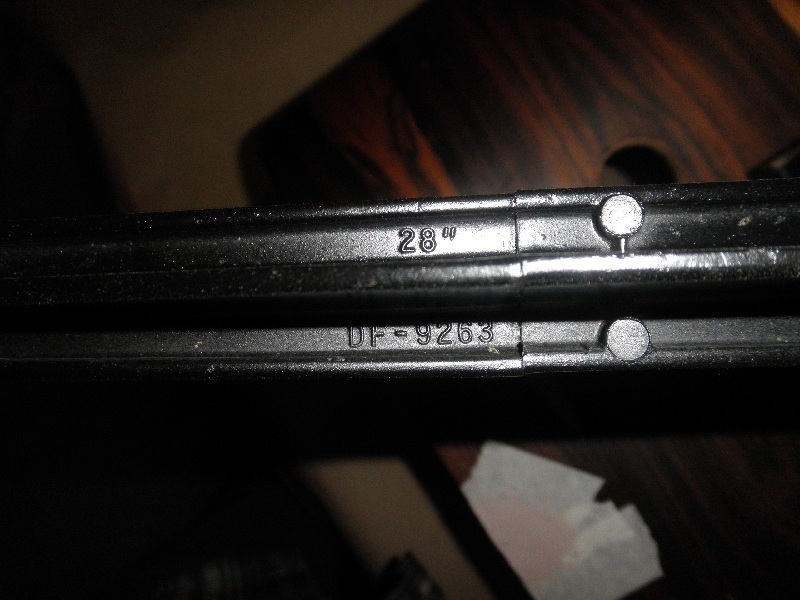 No shock mounts, uses bolts through the outer shells and directly into the 1/16″ thinner steel arms. 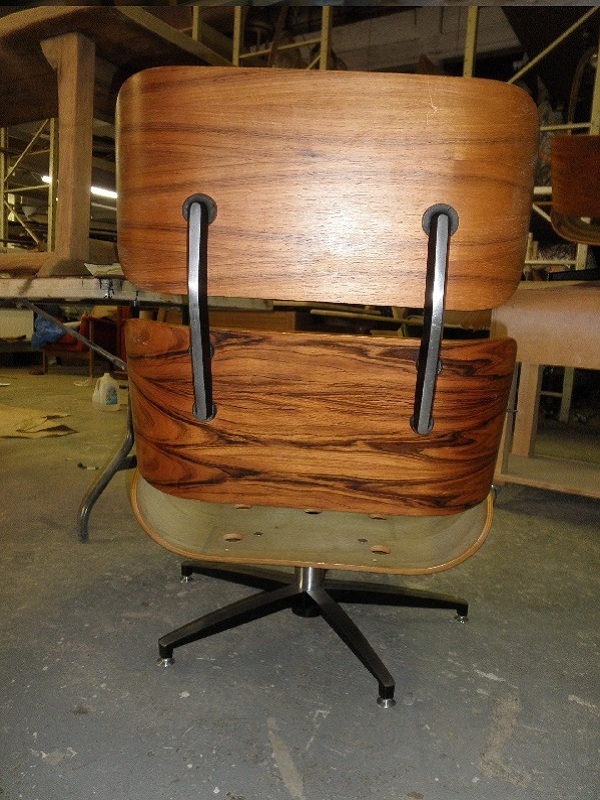 Thicker shells than the Eames Herman Miller. 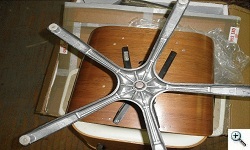 Different base, with typical office swivel chair spider mechanism. Shown without cushions, to make differences more apparent. 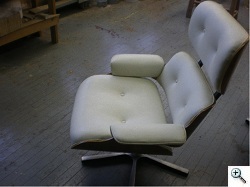 This chair has a single welting around the arm cushions, the Herman Miller Chair two lines of welting, top and bottom. 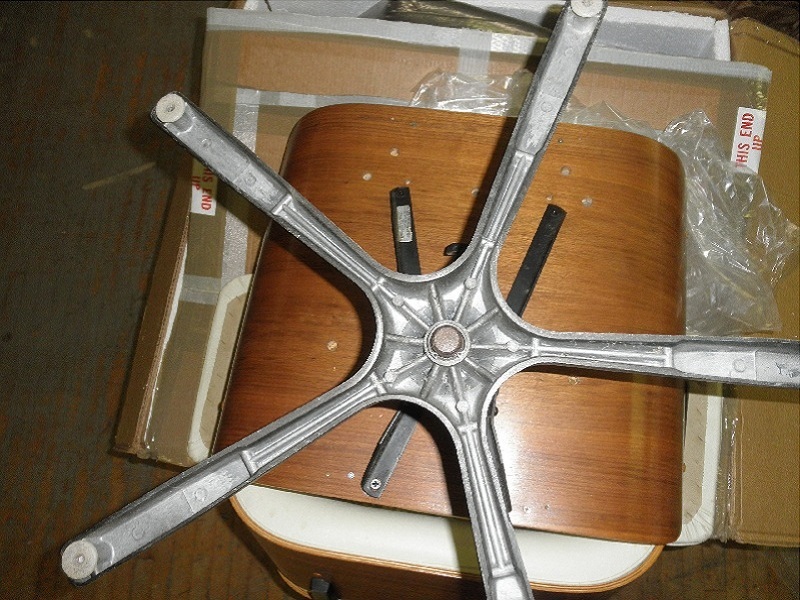 A later variant of the Segal base, more similar to the five star legs of the Herman Miller Base, with different conical swivel glides, and a notable stem not present in the Herman Miller chair. Some are marked “Midwood Manufacturing” on the round plate beneath the central post. 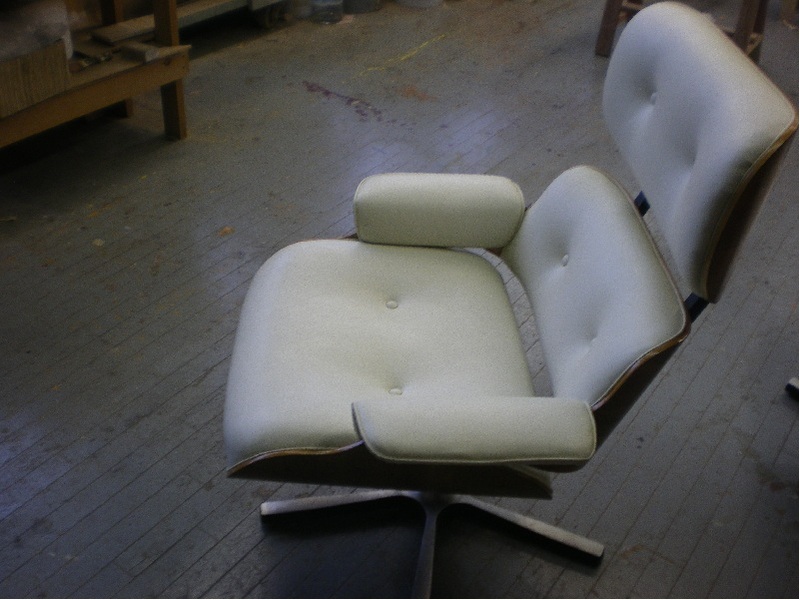 Leg cross section also differs from Herman Miller. 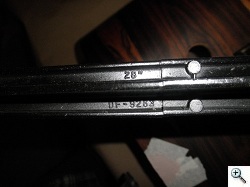 Note DF-9263 28″ marking in casting. 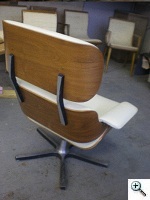 The Plycraft Eames lounge Chair, from the 1960’s. No shock mounts, uses bolts through the outer shell, and straps from the lower shell to both sides of the seat shell, and a third strap at the center of the back lower shell to the seat shell. A cheaper imitation than the Segal. Tubular chromed base, and back supports, not cast brushed and painted aluminum like the Herman Miller, Vitra, and Segal chairs. No welting on arms. 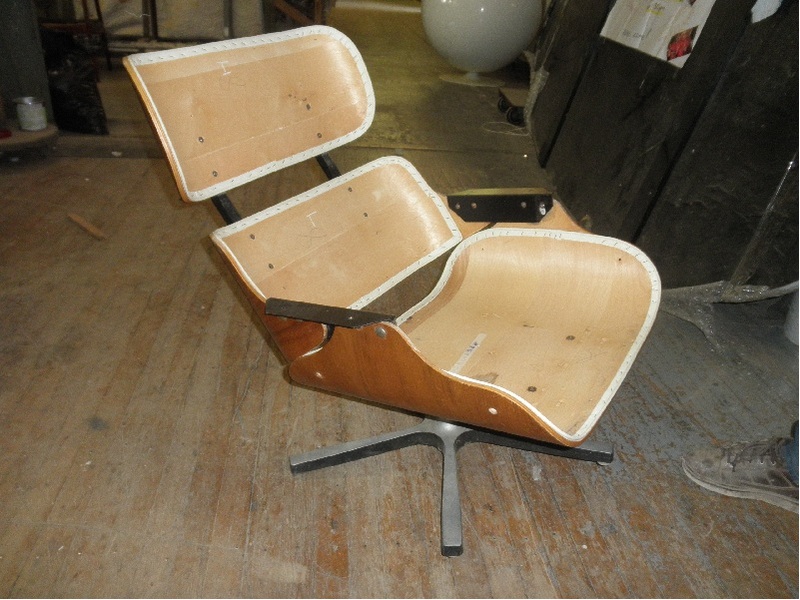 Vitra Lounge Chair, the Charles & Ray Eames-licensed European manufacturer of their Lounge chair. 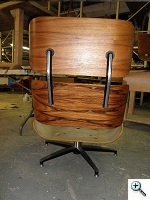 Note the different base than the Herman Miller chair. 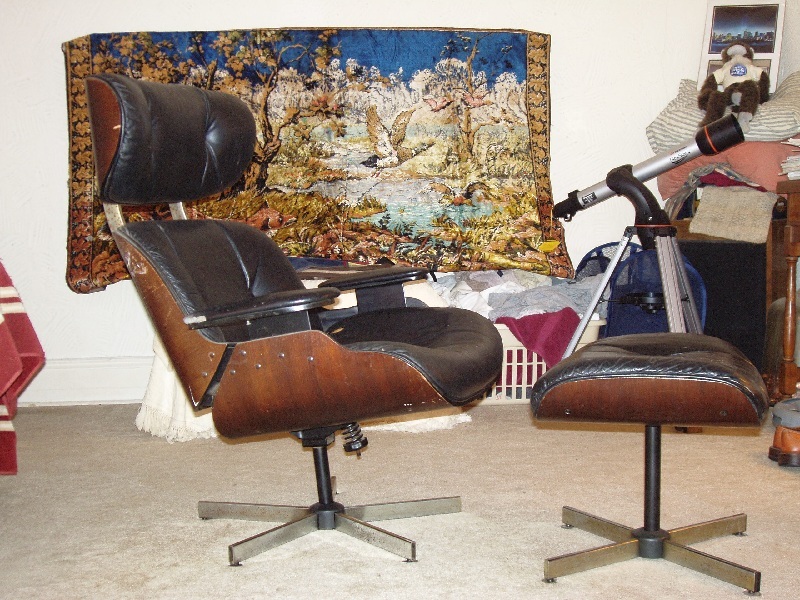 Is your Eames chair real? 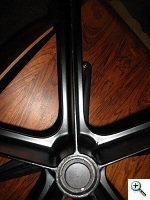 Send us photos and we will help to distinguish real chairs from fake. After emigrating from Europe after World War II, Olek Lejbzon settled in the U.S. where he founded his own firm, in 1950. From that day until the present the firm has proudly carried on a family tradition of the finest European craftsmanship passed down by two generations of Polish cabinetmakers. Today, a former partner of Mr. Lejbzon and now full owner of Olek Lejbzon & Co., Peter Triestman manages the company’s European craftsmen. Over the past four decades, Olek Lejbzon and Co.’s refusal to cut corners and commitment to superior craftsmanship has earned it a loyal following from antique collectors and dealers to Fortune 1000 companies, foreign embassies, religious institutions, universities and schools, restaurants, museums, and private residences. The company’s areas of expertise include the maintenance, repair, and conservation of antiques as well as architectural fabrication and preservation; the conservation of antique objets d’art; decorative painting and gilding; upholstery using the materials and styles originally employed; stone, marble and metal repair and restoration. Specialties include marquetry (wood, ivory, brass and tortoise shell), carving, gilding, hand turning, caning, antique paint conservation, faux graining, and fine French polishing. Fabrication work includes custom wood or metal doors and windows, wood millwork paneling, cabinetry, and moldings.